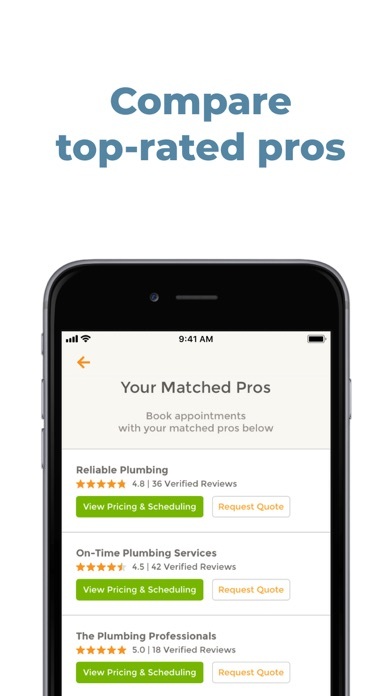 HomeAdvisor is the #1 home improvement app for connecting homeowners with home service contractors. 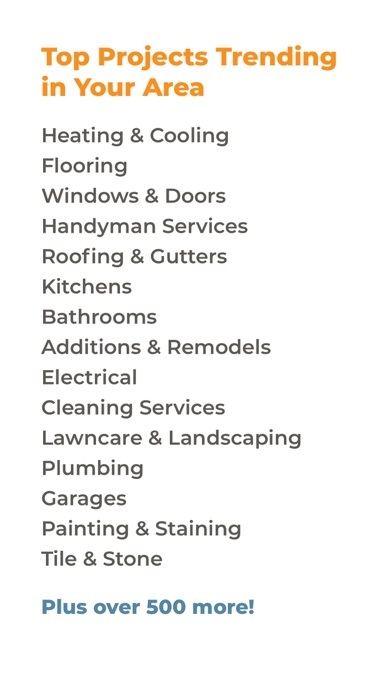 Find the best local contractors from our network, featuring hundreds of thousands of customer-rated pros specializing in more than 500 home renovation, repair and maintenance projects. 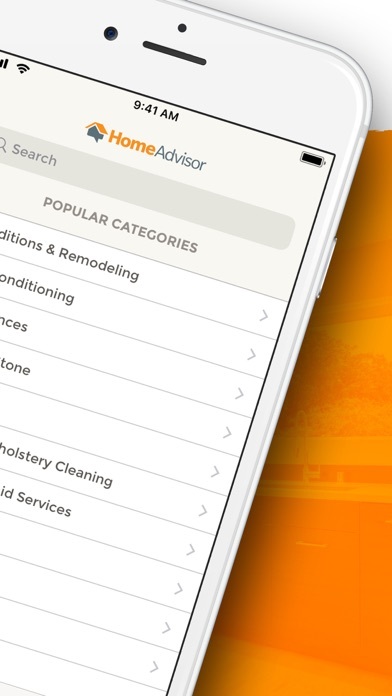 Schedule your next appointment with the HomeAdvisor app - the fastest and easiest way to find top contractors. 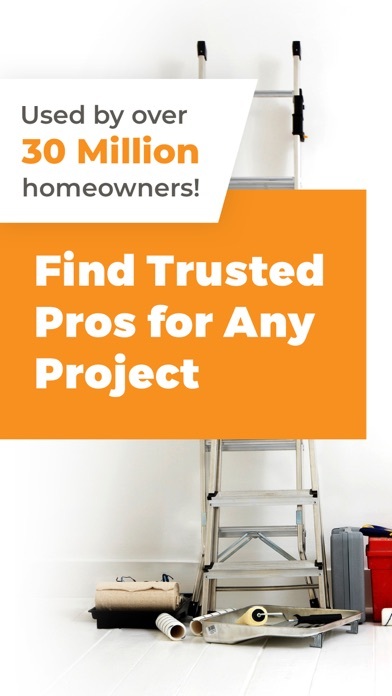 Whether you need help with home remodeling, home improvement, home repair, roofing, maintenance, or anything else around the house, we can connect you with the pro you need. 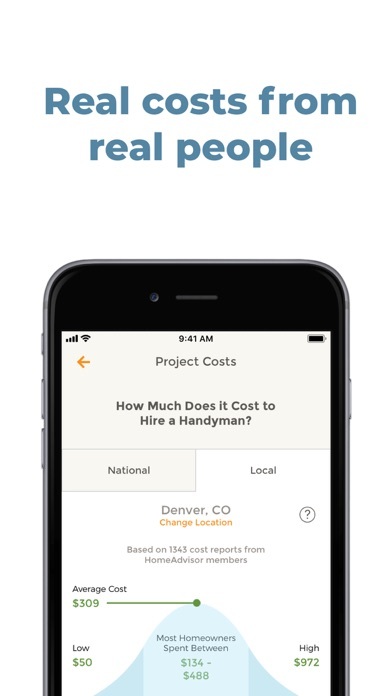 HomeAdvisor’s free home improvement app lets you discover and compare contractors, read reviews from real customers, view pricing, and schedule their appointments. 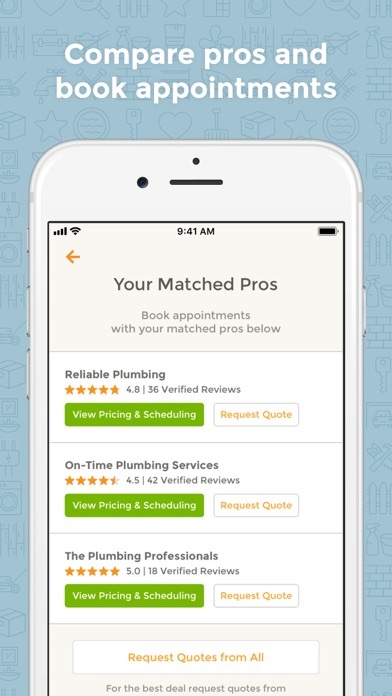 Schedule home improvement appointments quickly with our instant booking option, so you can book the best local contractors without having to play phone tag. Remodeling and renovation projects are now easier than ever when you find and book a contractor through HomeAdvisor. From landscape design to pest control to home renovation, HomeAdvisor can find you the professional for the job. 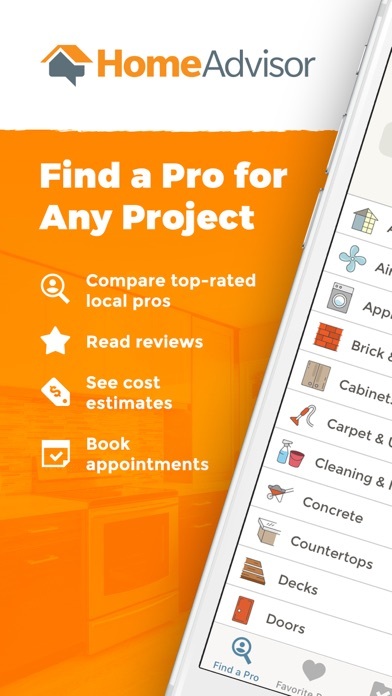 Download HomeAdvisor for free today and find contractors for your home improvement and repair projects anytime, anywhere. 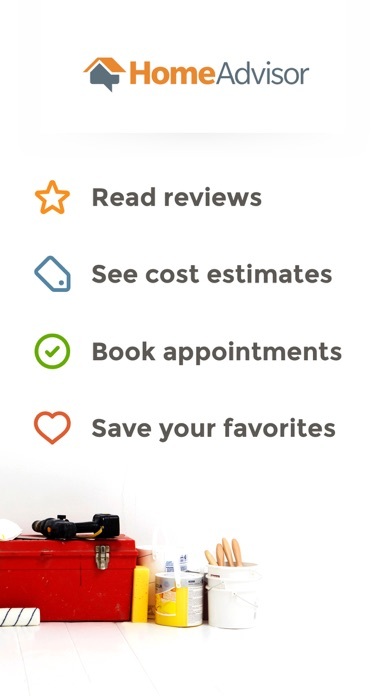 HomeAdvisor Features: CONTRACTOR FINDER - Discover home improvement professionals and compare their ratings and reviews - Search HomeAdvisor’s extensive network of contractors for any home renovation need - Book contractors and set up appointments instantly with local, available pros - View contractor ratings and reviews from real customers HOME IMPROVEMENT PLANNER - Compare home services costs for hundreds of home projects with True Cost Guide - Track contractors and home improvement projects HOME SERVICES & MORE Find and hire contractors for home remodel, repair and improvement projects, including: - Remodeling & Additions (Kitchen & Bathroom Remodels) - Roofing - House painting - House Cleaning & Maid Services - Windows - Tree Services - Renovation - Concrete - Handyman Services - Electrician - Heating & Furnace Systems - Pest Control - Decks - Foundations - Plumbing professional - Lawn care & maintenance - Landscaping - Lawn mower - Garage Doors - Siding - Tile - Fences Find home remodeling, improvement & repair contractors with HomeAdvisor – the fastest and easiest way to schedule the professionals and services you need. 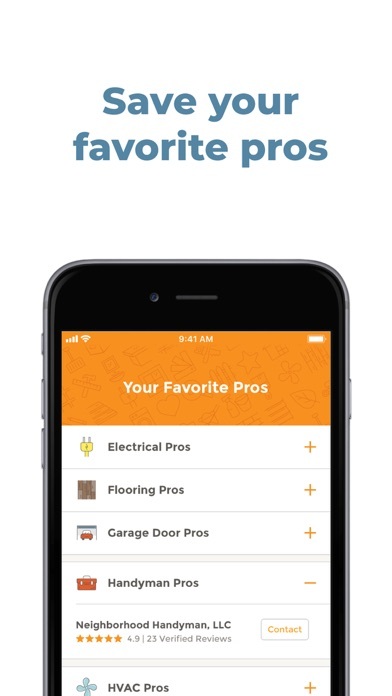 Download now and start your next home project! 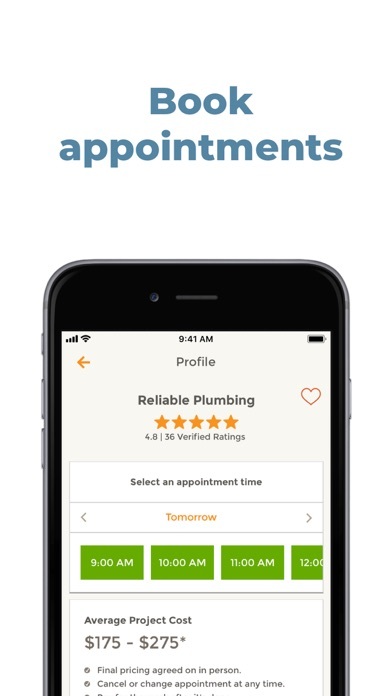 Made an appointment with through the app, which then sent me confirmation of the appointment. Took time off for the appointment in the day. The appointment time comes and no one shows up. I reach out to the company and the guy says he never confirmed any appointments this week. I am not sure how this app operates but this is unacceptable. Had I known I would have just contacted the company on my own. I have tried to get a quote twice but have not been contacted. I am trying again. Home Advisor is very easy to use. Home advisor is ripping off contractors left and right. I found out through different contractors they are getting charged $50 for just contacting the customer. I called two different contractors to look at my job. I feel so bad that they were charged for the job they did not get. We are not charged but these contractors are getting rip off. My advice to people don’t trust this ripping off app and company. I had 4 estimates to have my kitchen heated floor tiling & counter top installed. The 1st contractor (on Friday)was going to me the estimate the following Monday. That took 2 weeks. I finally hire 2 to get the project started completed & paid half of the money as required. It’s been a week now and very little has been done. At the countertop gave me a estimate how long it would take. The flooring contractor, although he’s seems to be energetic, not the most organized. The problem is with the MOST of contractors on your site are too busy to focus on the customers needs. They all say “yes they can do the job“ but their work says the complete opposite. The current flooring contractor works by himself, but made it seem like he had a small crew & he had ONLY 1 electrician to assist him to complete the job. Poor decision on my part to hire him through your site. Live & Learn but I’m giving you fair warning NOTHING positive will be given about this site. Required to give address and phone before can see prices. The zip code should suffice. Not what the TV ad said. Outrageous pricing. Charged $400 to replace a plastic dryer vent cover on outside of house. 1/2 hr. labor and cost of plastic dryer cover was $400. Would never recommend for that kind of cost. Will also inform realtor both buyer and seller of this companies outrageous pricing. I have not used the service yet but like the idea behind the app. My issue with the app is that I cannot get any further Services to show after clicking Load More under a profile. I have reinstalled the app but get the same result. Is this a bug in the app?